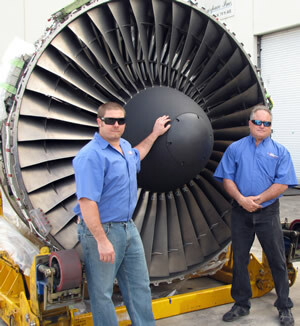 Left: Wayne Amodie Jr., Right: Wayne Amodie Sr.
Hi Tech Welding is committed to providing our customers with superior overhaul and aviation repair services. Our mission is to provide them with competitive pricing and one on one support that emphasizes quality, safety, loyalty and maintaining excellent customer service. Hi Tech Welding is a family owned business with over twenty-five years of experience in the repair and overhaul of airframe structures , engine components and accessories. We also provide specialized quality weld repairs and fabrication services for commercial, military and private aviation. Our industry wide reputation for outstanding performance, reliability and quick turn around times along with cost effective repairs has allowed us to grow and expand our capabilities over the years. Our certifications include FAA 145, EASA.145.6385, JCP and CAGE Code 3GWA9. Our highly experienced licensed mechanics and certified welders are specifically trained and certified to work with aircraft structures, engine components and exotic materials. In addition, we have the advanced knowledge of basic metallurgy related to aircraft materials. We value our highly skilled and experienced licensed mechanics, certified welders and operations department that help advance the company's success and common business objectives.